Chicana/o Studies professor Theresa Montaño is vice president of the California Teachers Association. Photo by Luis Garcia. California State University, Northridge Chicana and Chicano Studies professor Theresa Montaño has a pen collection she never intended to cultivate. As vice president of the California Teachers Association (CTA), Montaño has stayed at countless hotels while traveling the country advocating for public education, picking up a pen at every stop — unlikely tokens to prove her tenacious dedication to improving the state of learning. 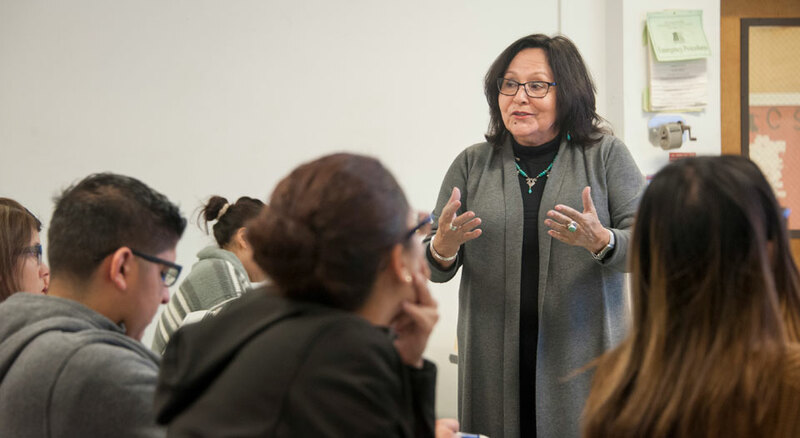 With almost 40 years of professional education and advocacy experience, Montaño is a seasoned K-12 classroom teacher and co-author of two books. And on top of her commitments, she still finds time to teach and mentor students at CSUN. What fuels her voracious appetite for all that work? Her passion for education began during her childhood, when she realized that she wanted to be a teacher. The first in her family to go to college, she volunteered for a community service project at CSU Los Angeles — where she earned her bachelor’s degree in Chicana and Chicano studies and her teaching credential — called the Educational Participation in Communications (EPIC). Through EPIC’s Asian, Black and Chicano Pride program, she got her first experience making lesson plans and teaching ethnic studies to elementary school students. Montaño began her career as a substitute teacher in 1979 and became a full-time social studies teacher in 1982, teaching in the Los Angeles Unified School District (LAUSD) at Stevenson Middle School in East Los Angeles, Lincoln High School and Virgil Middle School. She also spent a period of time teaching in Denver, Colo. Early in her career, Montaño was identified as an innovator, not only in the classroom, but also by helping provide professional development for others. At UTLA and LAUSD, she worked on projects such as “Dial-a-Teacher,” Multilingual Teacher Academies and the New Teacher Academy. Montaño also advocates on behalf of teachers — she helped establish a program for teachers interested in securing their National Board certification and protect their stipend and retirement benefits. She served on the staff of UTLA and was the first coordinator of the Helen Bernstein Professional Development Center. Her involvement in UTLA opened up opportunities to become an education policy advocate at the state and national levels. As a child of a working-class father who participated in a union for baker and confectionary workers, as well as working as a gardener, Montaño said she understood the critical role unions played in labor protections — and she joined UTLA immediately after she became a full-time teacher. Montaño offers a unique perspective on education in the current political climate. Public education advocates have been fighting the push toward privatization of schools, she said — particularly the rise of for-profit charter schools. Though California is facing a major teacher shortage, the accomplished education leader said she is hopeful, however, for future teachers. Montaño said she is encouraged by college students today, who are the most social justice-minded generation she has seen in a long time. Montaño wants young people to know that she and people in her generation will provide support and guidance, but that they need to take the lead in education and in broader society.